More orange - Stop staring and start sewing! 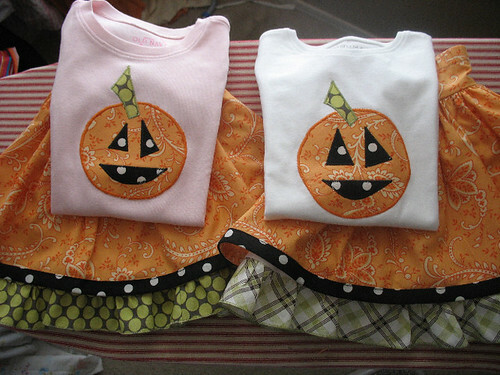 Here are a couple little outfits I'm shipping out to some very sweet customers. I really love the different ruffles (I think they will too) and the goofy grin on the jack o' lantern. I have just enough of the orange fabric left to make a fun stripwork skirt to go with my pink sample t-shirt so I'm hoping to get that done this week. Fun stuff!